Saw the light of day while experimenting with different kinds of chine collé paper of Japanese and Indian origin, old worn posters and old wall paper. 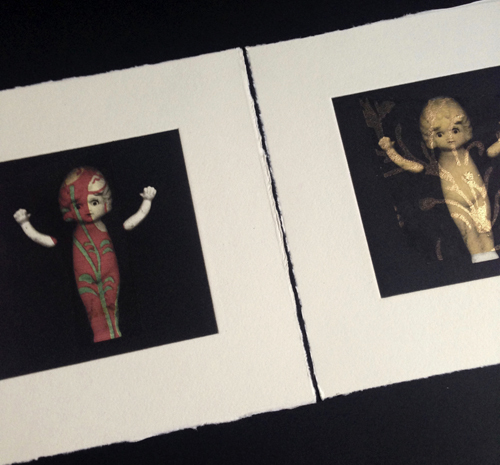 All used on the same plate representing an old worn bisque doll with loose arms. Each of the 9 prints are unique. The title reflects our modern society where tattoo of the human body has become an overwhelming important status symbol for so many people. The book is printed and bound in Copenhagen 2015. Printed on Zerkall Wove paper 340 grams, leporello format, book size 18 x 17.8 cm, each page paper size 17.5 x 17.5 cm x 9 unique photogravure prints with chine collé of handmade Japanese and Indian paper, old poster and wall paper + colophon. Total length fully open when lying flat 206 cm. Cover in black linen, inside black carton. Pages glued together with black linen. The font used for the title on front page is laser cut wood and credit graphic artist Bjarne Agerbo, Copenhagen.